Growth and comfort can’t ride the same horse. It’s a lesson that holds true for all of life. What we want most will always require embracing discomfort and taking action despite our fear that we’ll fail or fall on our face. In the end, there is no substitute for courage, no shortcut to bravery. To become the person you most need to be and create the life you most yearn to live, you must be willing to do the things that scare you. Again and again and again. There is no magic formula to forever liberate you from fear. Nor would it serve you if there was. However, there are specific things you can decide to do that will, over time, help you to fear less and reclaim the power that fear too often wields. The seven steps below are from my latest book, Make Your Mark. Practice them daily, and over time you will “train the brave” within you. 1. Own it: Bring your fears into the light. 2. Tame it: Reign in catastrophizing. Our imagination is a wondrous thing. Without it, the most beautiful works of human kind would never have been brought into existence. Yet, when fueled by fear, our imagination can drive us to underestimate ourselves and overestimate the potential negative consequences of taking action. By turning shadows into monsters, our imagination can fool us into believing that danger lurks around every corner and that we’re safer staying exactly where we are. Catastrophizing is the tendency to jump to the worst-case scenario as the most likely (or only) outcome in any situation. It is a terrible habit, but one you can break with this exercise. When you balk at the prospect of doing something outside your comfort zone, try asking yourself, What’s the worst thing that could happen? and then sitting with any fear that arises. Own the fear. Then tame the fear by asking yourself, So, what would I do if that happened? Repeat this cycle for each worst-case scenario you can envision. In this way, you will come to know that even if the worst did happen, which is often highly unlikely, it would not kill you. Rather, it would introduce you to yourself on a whole new level: You’d learn, you’d grow and you’d emerge from it a wiser, braver and better version of yourself than you were before. As I wrote in Brave, daring to expose yourself to those monsters in your heard is ultimately far less frightening than spending your entire life running from them. Taming your fears also opens up space to ask yourself, What’s the BEST that could happen? 3. Name it: Call out your critic. Who are you to do that? You don’t know what you’re doing. What will everyone think? You’ll make a fool of yourself. You don’t know what you’re doing. Stick to what you know. No one can escape the inner voice that is our own worst critic, who urges caution at every step and preaches pessimism at every opportunity. Yet everyone can learn to relate to it for what it is: the most primal part of our being, simply trying to keep us safe. It just has a rather primitive way of doing this. When the voice of fear in your head (or in the pit of your stomach) is at its loudest, it’s because it’s feeling the most threatened. Giving your fear a name helps you to recognize it for what it is. It’s an emotion, but it’s not reality, and it’s not YOU. And it certainly doesn’t deserve to hold the power to keep you from taking center stage in your own life. It doesn’t matter what you call your inner voice of fear—Little Me/Doubting Debbie/Chicken Little/etc.—only that it helps you to realize that you are not your fear, and your fear is not you. So, next time your fear starts reminding you of all the risks like an overprotective parent lecturing a child, acknowledge its concern, and then, with all the authority you can muster up, let it know who’s boss! 4. Flip it: Rethink risk. Playing it safe can be a high-risk approach. We human beings excel at imagining how awful we’ll feel if we take a risk and we fail. Yet, we’re often lousy at imagining how we’ll feel a year from now if we choose to do nothing. We tend to focus only on what could go wrong if we exit our comfort zone. It’s only rarely that we stop to consider what we put at risk if we stay put in our comfort zone, much less get really honest with ourselves about it! You can “flip” your fear of risk by stepping into the shoes of your future self and imagining how you’ll feel in the years to come if you’ve let the fear that’s undermined your actions until now continue to pilot your life. Visualize yourself staring at your reflection in a mirror five, 10, even 25 years from now, after you’ve allowed your fear to call the shots. Ask your future self what your fear has cost you. At the end of life, most people regret the risks they didn’t take far more than those they did. So don’t discount the cost of inaction. Plus, things that aren’t working now generally don’t get better when left unattended; they get worse. Playing it safe can grow increasingly costly as it exacts a mounting toll on our health, wealth, career, relationships and life. “Flip” your fear, and your future self will thank you! 5. Embody it: Tap your inner Braveheart. The capacity for greatness resides within every one of us. Without exception. It’s just that some of us have been living inside a story about our own inadequacy for so long that we’ve become strangers to the bravest part of ourselves. Stand (or sit) tall, as though there were a string pulling up through your head, so you are long and tall and strong. Bring your shoulders back. Wear a quiet smile on your face. Lift your chin and look gently upward. Hold in your stomach muscles. Place your feet shoulder-width apart, firmly rooted to the ground. Take three big, deep breaths and imagine a time you felt like you could take on the world. Strong. Capable. Confident. Purposeful. Unstoppable. Breathe into that feeling. Clench your fists for five seconds and store that feeling in them. Now, connected to your bravest self, visualize yourself doing the very thing you know you need to do to move toward the life you most want, to do whatever has been tugging at your heart for too long. What is it you must do? Where are you? Who are you with? What are you doing? What are you saying? What are you creating? Picture yourself taking bold, self-assured action. Picture the people around you reacting to you as someone who knows their own worth and what they want, as someone to be admired, to be respected, to be reckoned with. Feel the power of that moment. Take hold of it. Remember it. Own it. Now get ready to use it. 6. Risk it: Take the leap. I remember the first time I ever got up on stage to deliver a speech at a major conference, I was so nervous I felt nauseous. But then I took a deep breath, focused on the mission that had brought me to that point, and out I walked. Within moments, my fear had vanished, and by the time I finished, I was wondering why I’d ever doubted myself. We all come to moments throughout our lives where we have to let go of the safety of where we are now and venture into the uncertainty of the future. That moment requires courage. Lots of it. Yet the more often you put yourself “out there”—out on the limb where only the daring venture to go, out in front of the very people who can open new doors, buy your wares, test your talent, build your tribe or broaden your thinking—the sooner you’ll strike it “lucky.” Though of course, it won’t be luck at all. We fail far more from timidity than we ever do from over-daring. There will never be a “perfect” time to make the change, take the chance and step toward the future that is waiting for you. But the next best time will be now. and always will be, the singular most powerful antidote to fear. By simply daring to take a single step in the direction that inspires you, you send a signal to yourself and to the universe that you’re serious about creating a future that is different—bigger and better—from your past. Don’t wait to be discovered. Don’t wait until you’re a master. Don’t wait to be given permission. Don’t wait for the universe to send you a message in a bottle or for Mr. (or Ms.) Right to show up on your doorstep. Above all, don’t wait until you’re 100 percent sure you can’t fail before you take that first exhilarating and terrifying step toward the future that is waiting for you. Just get started. Right away. As in NOW. The universe will do its bit. But you have to do yours. 7. 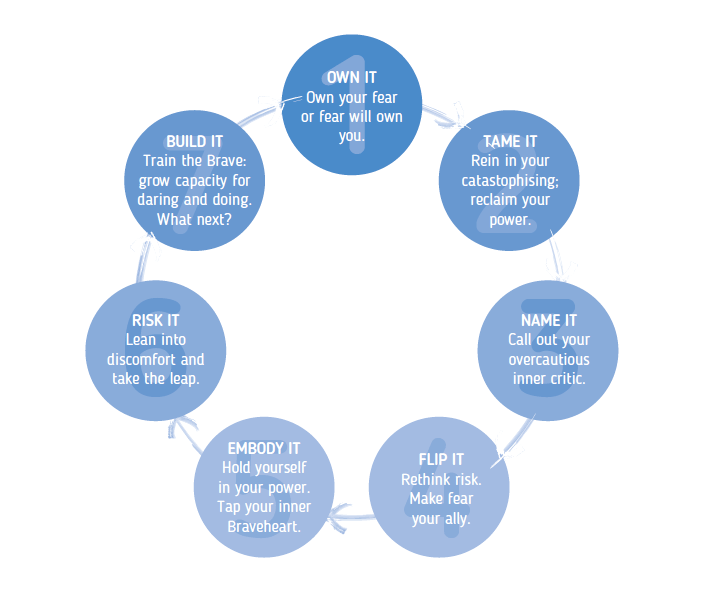 Build it: Train the brave. If you haven’t lifted weights for a while (or ever), lifting 5 pounds may push your limits. But if you train every day, over time 5 pounds will start to feel pretty light, and soon you’ll be looking for the 10-pound weights. The same is true of bravery: It’s like a muscle. If you keep showing up, keep practicing, and don’t let discomfort deter you, over time those initial acts of courage become less daunting, and you find yourself doing bigger and braver things… with less effort than you expected. That’s because courage is a skill, and like all skills, it can be learned and mastered. It just takes a committed effort. As you grow more comfortable with being uncomfortable, fewer things will scare you. It’s by acting as though you are fearless that you start to actually fear less. Once you own them, tame them, flip them and take action, any lingering fears will be easily managed, until they shrink and fade away. I have left my comfort zone now thousands of times since leaving that small farm in rural Australia, and I’ve learned that every time you take action in the presence of fear, you dilute its power and amplify your own. Even better, you come to realize how little you ever needed to doubt yourself to begin with! So, feel your fear, but be brave and take action, anyway. What you want most is riding on it. Margie Warrell, what an inspiring article you have written there. All of us need to be reminded of that on a regular basis to become the people we are meant to be. Thank you for helping elevate us all to reach for higher standards in our own lives and to go out into the world and be fearless. It is every educative, and informative article,thank you somuch and God bless! Love this article! Thanks for the great lessons and reminders!!! Truth and facts many people miss…. Human Beings only have “TWO” NATURAL FEARS. All our other fears are “LEARNED”. Great article! Fearfulness is the ultimate roadblock to success. This article has provided us with solutions to reclaim our lives back, and be fearless. This article came at the right time, reinforcing who I truly am when I needed it the most! Thank you for your work. You are a blessing to this world. It is illustrated correctly. But there are opposite side of the situation. Refreshingly encouraging piece. Thanks for writing it.